Snack Girl recently found out that her favorite apple pie was 420 calories for one slice. Ouch. It is this kind of information that has led me to the conclusion that pie is a treat. How about an Almond Joy? A Hershey's Almond Joy bar is 220 calories. What if you could make a close match for 90 calories? I met Marisa at a cookbook writers dinner and since I don't have cable television - I missed that she was a Top Chef contestant. I should have pumped her for inside information on the show, but instead we got talking about making quality desserts with fewer calories. What seems important to me is that a dessert still be a DESSERT. If you go to the trouble of making the recipe, you want it to taste like a treat. For example, she has remade my 420 calorie apple pie into a "Gingersnap Apple Pie Parfait" that is only 230 calories. Would I miss my favorite apple pie by replacing it with this? Probably not because she managed to mix great flavors - ginger, brandy, and apples - with a 1/4 cup slow churned vanilla ice cream. Yum! Many of the recipes in the book feature a "sugar free" option where she has substituted Truvia when it works for the recipe. 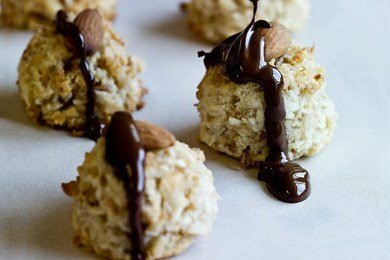 These "Almond Joy Macaroons" were easy to make and lasted a while in a plastic container. I couldn't find unsweetened shredded coconut so I used sweetened shredded coconut and reduced the sugar to 3/4 cup after some heavy math. I loved the pineapple flavor mixed with the coconut. I would probably rename these "Pina Colada Cookie Bites" because of my penchant for tropical drinks with umbrellas. Check Marisa out on her website: Marisa Churchill where you will find a couple other recipes to sample. reprinted with permission from Marissa Churchill's "Sweet & Skinny"
As a child, I loved coconut desserts: macaroons, coconut cake, and especially the chocolate and coconut Almond Joy candy bar. I haven’t eaten one of those in many years, but I do eat these cookies, designed to be reminiscent of the candy, but much better for you. In this version, pineapple replaces some of the coconut for natural sweetness with fewer calories. Put the pineapple, coconut, sugar, egg whites, flour, and salt into a medium saucepan and cook over medium-high heat, stirring constantly, for 5 to 6 minutes, until all of the liquid has evaporated and the mixture is thick like oatmeal. (Do not be concerned if the mixture browns along the bottom of the pan.) Remove from the heat, stir in the vanilla, and refrigerate for at least 1 hour. To bake the cookies, preheat the oven to 350°F. with a rack in the center position. Coat a baking sheet with pan spray or line with a silicone baking mat. Scoop out tablespoon-size balls of the mixture. Arrange the cookies on the baking sheet about 1/2-inch apart (they will not spread). Press an almond into the top of each cookie. Bake 20 to 25 minutes, until the cookies are golden brown. Halfway through the baking time, rotate the pan from front to back. Transfer the cookies to a wire rack until they are completely cool, about 1 hour. Melt the chocolate in a double boiler until you can stir it smooth. (Alternatively, use a microwave oven.) Spoon the melted chocolate over the cookies in a zigzag pattern. Allow the chocolate to harden, then serve. The cookies can be stored in an airtight container at room temperature for up to 1 week. The cookie dough can be made up to 2 weeks in advance and refrigerated, tightly covered, until forming the macaroons and baking. Snack Girl receives a small percentage of sales from this link to Amazon.com. I am just concerned about the egg whites being cooked like an omelet when exposed to heat before baking.Couldn't we just bake it directly like we usually do with coconut macaroons? Great recipe! I love almond joys and these cookies sound wonderful!! Where can I get the Ginger Apple Pie Parfait recipe? I went to Marissa's site and didn't find the recipe. My husband loves apple pie but is on a severe carb restricted diet because of early onset prostate cancer so this would be a huge treat for him. I see your readers have a couple of questions. To Ghada, you have to cook the batter first or the cookie batter will be too loose. It is simple, just stir constantly and the egg whites will not curdle, cook till its thick like oatmeal. This will work for Passover! Hi,My husband & I do low carb so I thought I would try these with splenda,sugar fee chocolate chips,carbquick, and they were great with only 56 carbs in whole recipe which is about 1.2 per candy. Thanks, I love almond joy.